We have had quite a week so far, starting on Monday 24th May, which was a public holiday in Britain, catching us out a little as our planned bus legs were not available. So we got my mum to drop us off at Flint station at 8:00 am, rather than catching the buses to Mold and Chester. From Flint we took a train to Chester, then to Warrington Bank Quay, changed onto the train to Lancaster, and then on to another to Barrow in Furness, and finally to Ravenglass on the Cumbrian Coast. Interesting train journeys, and relatively quick. We then transferred onto the Ravenglass and Eskdale narrow gauge railway for the trip to Dalegarth in Eskdale (about 7 miles and 40 mins away). This was great fun, and the second time we have used a narrow gauge railway on this trip! At Dalegarth, we buckled on our rather heavy packs (19kg and 14kg for me and Lynn respectively) and hiked over the fells from Eskdale to Wasdale Head, via Burntmoor Tarn. It was a lovely day, topping up our sun tans nicely, and dropping us off at the national Trust campsite in Wasdale, at the foot of Scafell Pike (highest mountain in England). We camped over night, feasting on Beans and Creamed Rice for our evening meal! Our new VangoAlpha 200 tent worked quite well, but is very small for me (1.83 metres), especially as both Lynn and I have broad shoulders, so it is quite narrow for us too! Kept us dry and warm though. Day 2, Tuesday 25th dawned a bit grey and changeable, but looked good enough for a walk, so we used the HollowStones route to climb ScafellPike. The walk up was mostly nice, with good views until near the top. It’s a bit steep and rocky on the path, but quite easy going. Near the top, the weather closed in in, and it was cloudy, windy and very cold. The wind chill must have taken it to sub zero. So we set off down the mountain down the Corridor Route, where it quickly warmed up again, and we enjoyed quite an exciting walk down, as this route has some quite exposed ‘scambles’ along it. 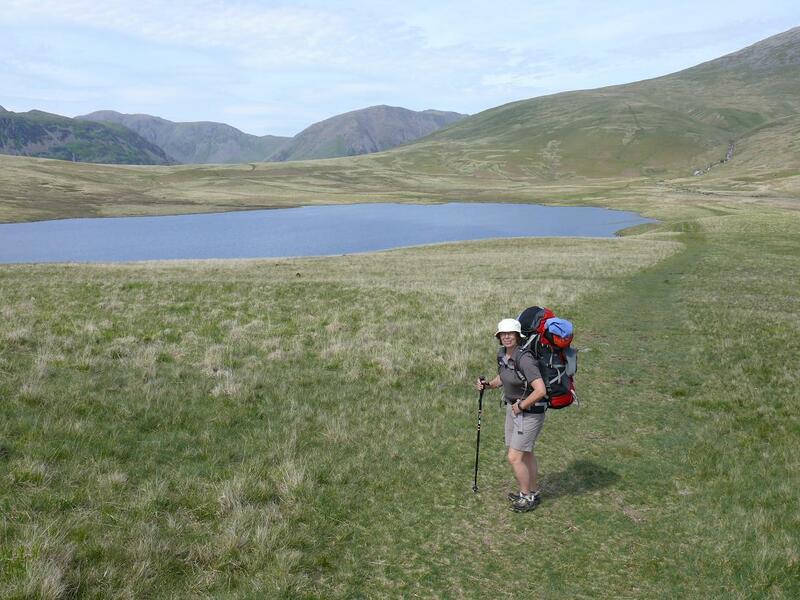 We didn’t bother going all the way to Sty Head tarn, turning straight down to Wasdalehead and back to the tent. John and Debbie, withRachel and David (their kids) were camped nearby, so we had a cup of tea with them while we caught up, and the dined on beans and sausage and more creamed rice. Camping recipe number 1 – put a square of Lindt 70% dark chocolate into each serving of creamed rice and allow to melt and mix in. This is a superb variation on creamed rice. Overnight it rained very heavily, and the tent performed very well again. It was still raining in the morning, so rather than hang around and go for a day walk and get a lift out, we decided to walk out from Wasdale, so set off about 10:45 from the camp shop, back up to Burntmoor Tarn, where we stopped at the abandoned lodge for some Irish stew. We had a couple of navigational issues on the way over, as the cloud was well down, and the paths were all running streams, so it was very easy to miss path junctions etc. But common sense and experience got us back on track. However, our packs are just not water proof, and a lot of our gear was not in dry bags, so our packs slowly filled up with water, and by the time we were starting down from the tops, they both weighed 3-4 kilos more than when we started. Next purchase – dry bags! At Dalegarth station I enjoyed some Cumberland Sausage in a bun, and Lynn some soup to warm us up, and some hot chocolate, before enduring a very cold ride back to Ravenglass in the outdoor coaches of the R&ER. Fortunately, when we got to Ravenglass, the campsite turned out to be quite comfortable, and the weather wamed up, so we managed to get most of our clothes mostly dry, using spin driers, tumble driers and radiators before going to sleep. Day 4, Thursday, was a bit grey and overcast when we set off, but the journey up the Cumbrian Coast on the 7:42 train to Carlisle was a magnificent couple of hours, including passing the Nuclear Waste Disposal plant at Sellafield. The train was full of plant workers, who really are just a bunch of normal people commuting to an ordinary job, and were nice people to talk too! The ride to Glasgow central through the Scottish lowlands was a bit ordinary, but very pleasant, and the walk from Glasgow Central to Glasgow Queen Street gave us a glimpse of what Glasgow is like (at least in the centre!). The 3.5 hour ride from Glasgow to Fort William was spectacular in parts, but was a bit grey and drizzly all the way. Incredible stations in the middle of nowhere, where grizzled trampers with huge packs got off and disappeared into the mist! Fort William was also grey and dark feeling when we got there, so we bought some supplies in case the camp shop was shut, then trudged the 3 km to Glen Nevis campsite, where the camp shop was fully stocked with everything! The campsite was wet but we found a spot and piched our tent, and managed to feed ourselves with pasta salad without getting too wet. the weather seemed to keep on improving all evening. Day 5, Friday 29th, dawned bright and clear, with a forecast of more of the same all day! 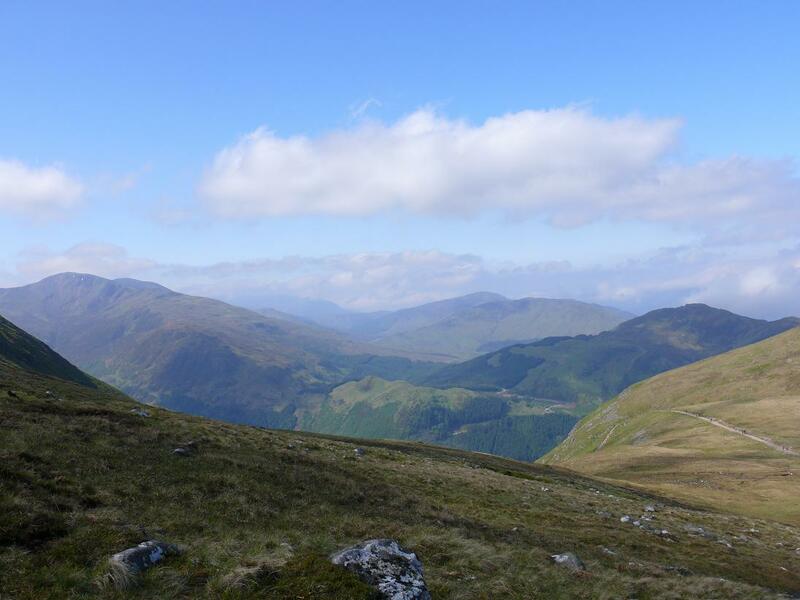 So we got our gear together, an extra 1.5 litres of water and a huge amount of food, and set off for the summit of Ben Nevis. BN is 1344 metres high, but has a major path all the way to the top, making it a strenuous but easy walk, so we were joined by about 500 day trippers (not an exaggeration, may have actually been more) climbing in tee shirts with an anorak and sneakers and a bottle of spring water in their hands! 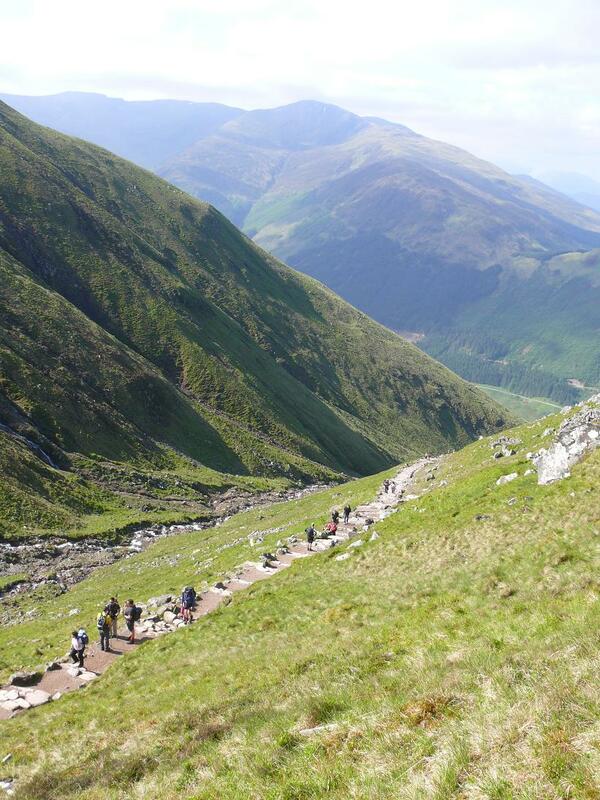 Pilgramage from Glen Nevis to summit of Ben Nevis! The walk up was so beautiful, the views breathtaking, but unfortunately our camera packed up at about 1000 metres, so we have very few photos, but many memories. As high as our camera got! There was about 1-2 metres of snow on the top 50 metres of the mountain, so as we were poorly equipped (by our standards) we didn’t linger, just a quick kiss to celebrate our 27th wedding anniversary, then off again to walk down. The nice easy walk on ‘paved’ paths on the way up, became a hobble on uneven rocks on the way down, as the ‘pavers’ were just stones embedded into soil, so were not the easiest to negotiate. I actually got a blister on my toe near the bottom. Anyway, 8 hours after setting off, we arrived back at our starting point, very satisfied but absolutely knackered! 4 hours up, 4 hours down, not bad for a combined age of 104 years! It remained a beautiful day until we went to bed at 22:30, and we managed to get all our gear properly dry in the sun, ready for the trip out. Day 6, Saturday, started with a taxi ride to the station in Fort William, to catch the 7:42 to Glasgow. 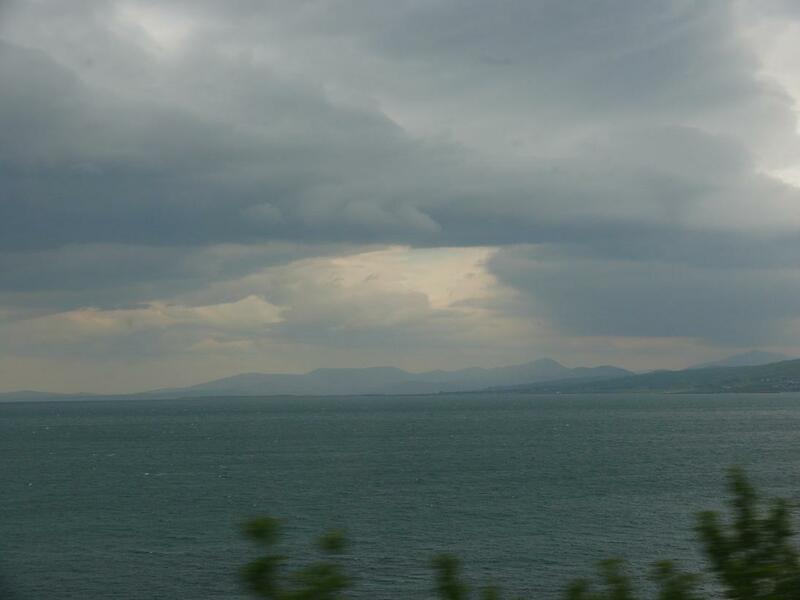 The weather was a lot better, so the scenery was even more spectacular. At Glasgow we caught the train to Aberdeen, where we were picked up by June and Alan, Lynn’s aunt and uncle, who are looking after us for a day or so before we go to Wales on Monday. A day of R&R sounds like a good idea! Our last day at Knoll House was spent visiting the Dolphin Shopping centre in Poole, where we bought Andrew a fridge for his room from Argos, and had one of the best coffees we have found in Britain! I am seriously thinking of giving up coffee for the duration. In compensation, the tea is very good EVERYWHERE we go. In the afternoon we walked with Andrew over Old Harry’s Rocks (that sounds rude, but it was something like that) and down into Swanage where we had a late lunch and another reasonable coffee. Then we walked back over Ballard Down, to Studland. Andrew ate with us for his two days off, which seemed a little uncomfortable for him and his colleagues, but it was good for him and us. We left Knoll House on Saturday morning after paying the bill – 908 pounds for 5 days for 3 people. May sound a lot, but I actually think it was worth it. Thanks to all the staff at The Knoll House for making the stay so enjoyable. The trip home to North Wales was a nightmare. Every route we chose was either deadly slow, following caravans, tractors, idiots etc, or almost stationary for 20 miles at a time on the M5 and M6 and M54 because of accidents and holiday traffic (this weekend is Whit Monday bank holiday, which is very confusing because Whit Sunday is next weekend!). It took us 8 hours to do 260 miles, which is really appalling. We made the mistake of stopping for a drink at a motorway services (Welcome Break at Telford), but walked out after spotting the coffee stains in the cups we were about to be served tea in! This weekend we have spent preparing for the next 7 days, buying some extra camping gear etc. 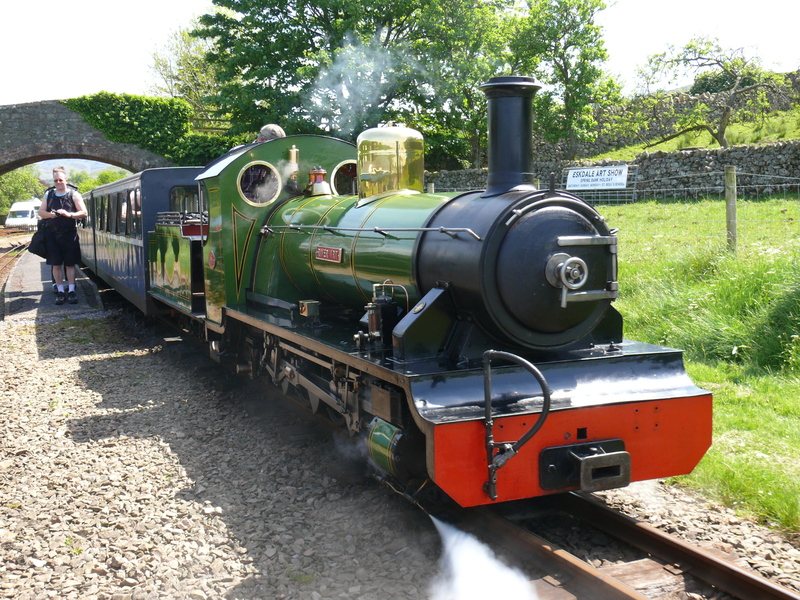 Tomorrow (Whit Monday) we are taking the train to Ravenglass in the Lake District, and from there we will walk into Wasdale Head and camp for a couple of nights, and where we will meet up with Debbie and John again. 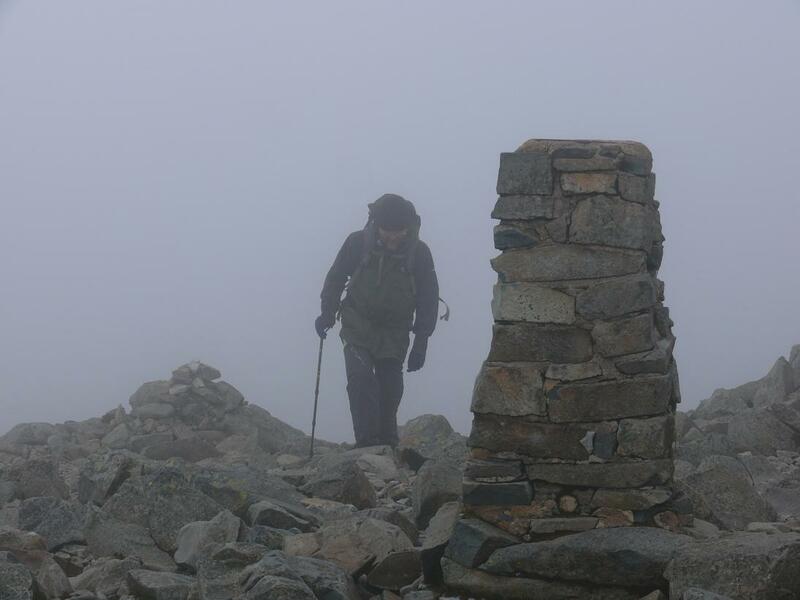 We hope to climb Scafell and Scafell Pike while there. We are then taking the train to Fort William in Scotland (9 hours!) 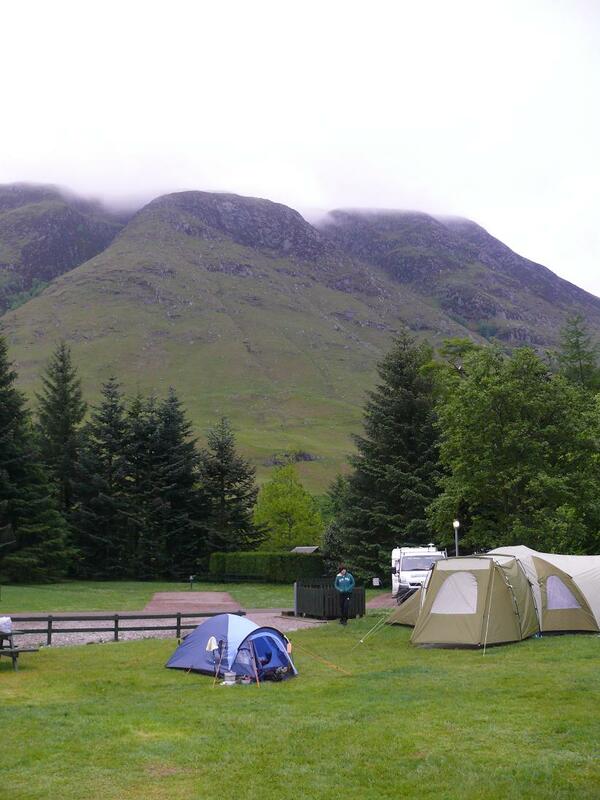 and where we will camp for two nights, and try to climb Ben Nevis. Then we will take the train to Aberdeen, where we will hire a car for a couple days, and visit June and Alan, Lynn’s aunt and uncle. Finally, we will take the train back to Chester and return to Mold. So, just like the heading says, we will probably be off line for most of the next 7 days, as the computer is not coming with us! See you in a week. 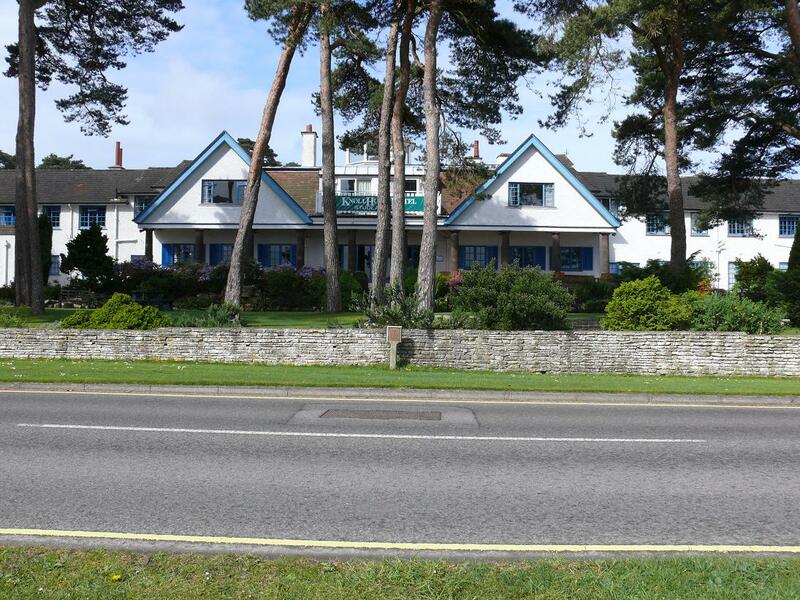 We are having a great time here at Knoll House, the food is superb, and the accomodation is very comfortable. I am getting a bit behind on this blogging thing, with being so busy. I tried to do a post last night, but lost it somehow. 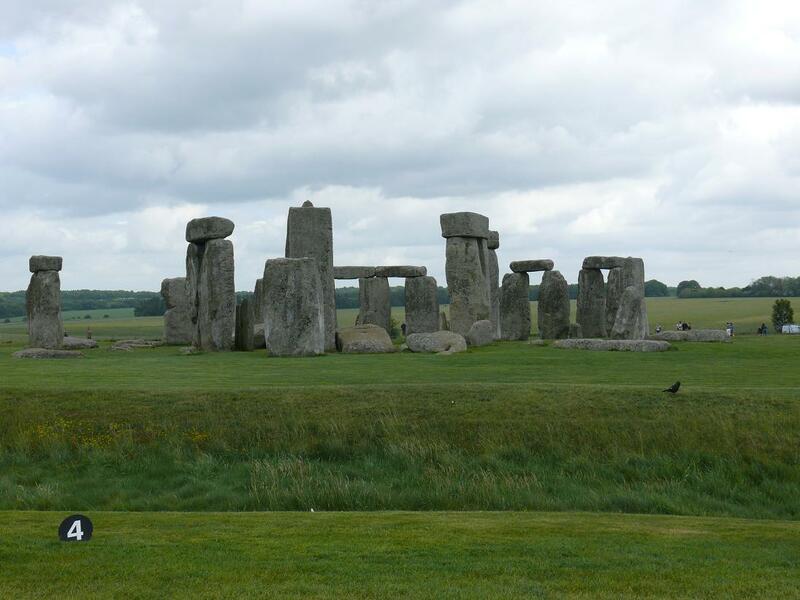 Anyway, today we went to Stonehenge (Mum, Andrew, Lynn and me). It was a bit of a trek, but well worth it. Six pounds each to get in, but there was a free audio guide which even mum enjoyed. It was a glorious day, if a little windy at times. 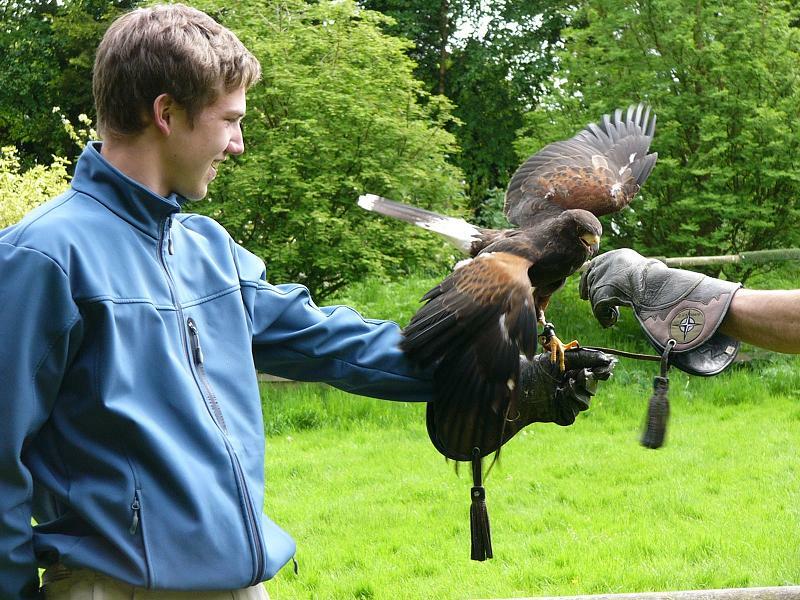 We then went on to the Weyhill Hawk Conservancy, which rescues and rehabilitates injured birds of prey, as well as breeding them, training them and showing them. 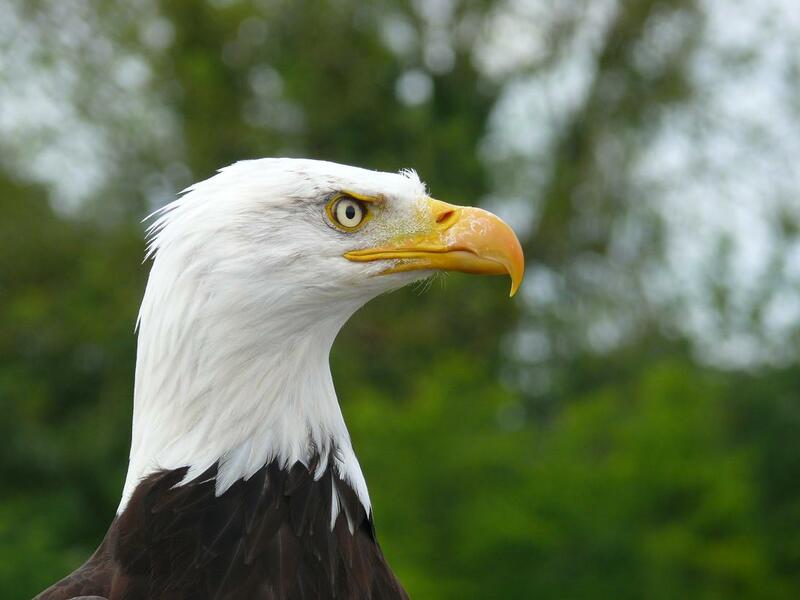 We saw an amazing show where six vultures flew over the audience, iterally brushing our hair with their wings, and which were hoined by about 8 black kites, all wheeling and flying over our heads. The finale where two bald eagles flew in from about 3km away, visible most of the way, to land on the falconers arms was incredible. 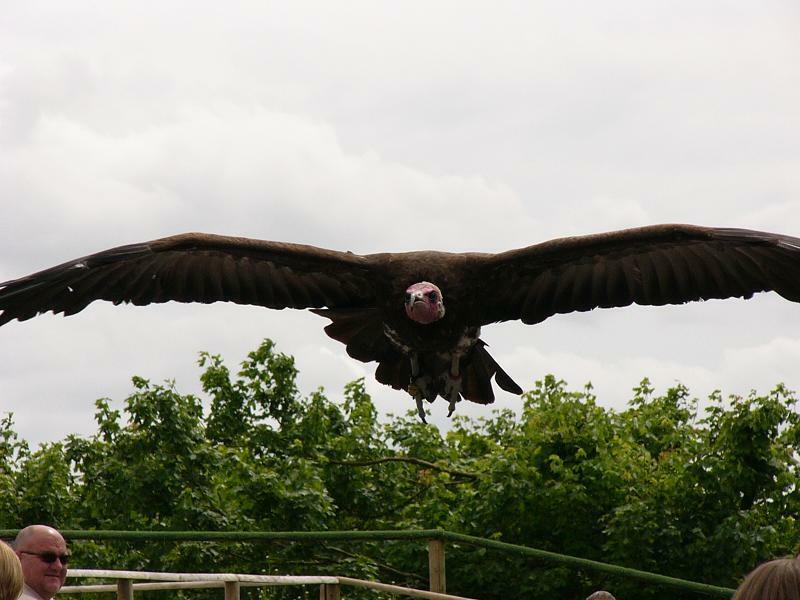 A vulture dive bombing Lynn! Yesterday we had a trip to Lullworth cove in the morning, where it was very cold and windy to start off with, but was an enjoyable excursion. In the afternoon we visited the Tank museum at Wool in Dorset – literally hundreds of tanks from the earliest to the latest, including examples of German tanks. Well worth a visit, but it was a bit expensive! 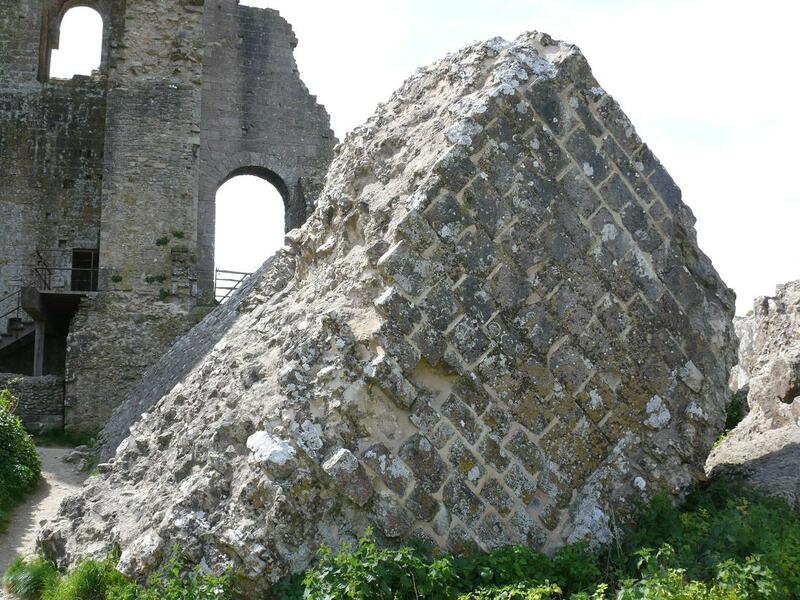 On monday we visited Corfe Castle in the morning, an excellent ruin, apparently it was blown up by the parliamentarians during the civil war, but enough remains to show how great a castle it was. 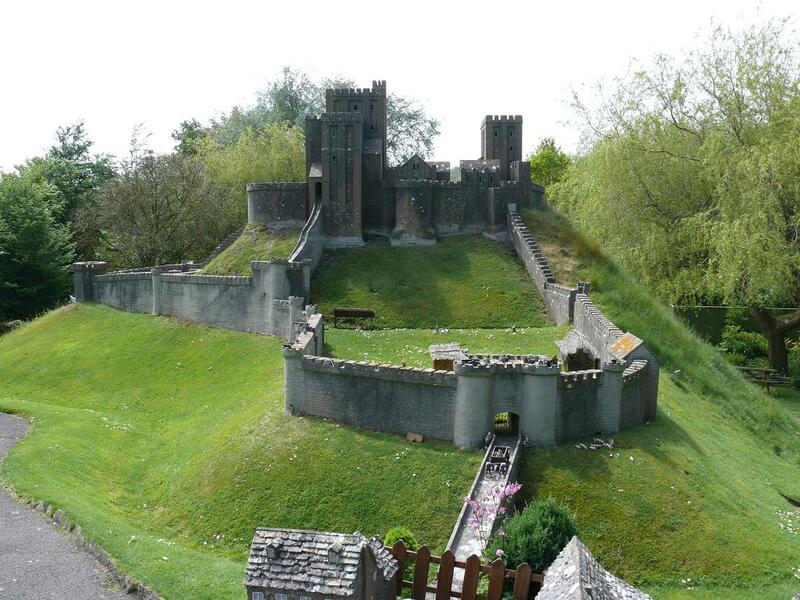 In the afternoon wed took mum to the model village in Corfe, which has a scale mdel of how the castle looked in its prime. The model is about 10 feet tall, and was beautifully detailed. It’s been a few days since I last posted, during which we have either relaxed or been very busy. 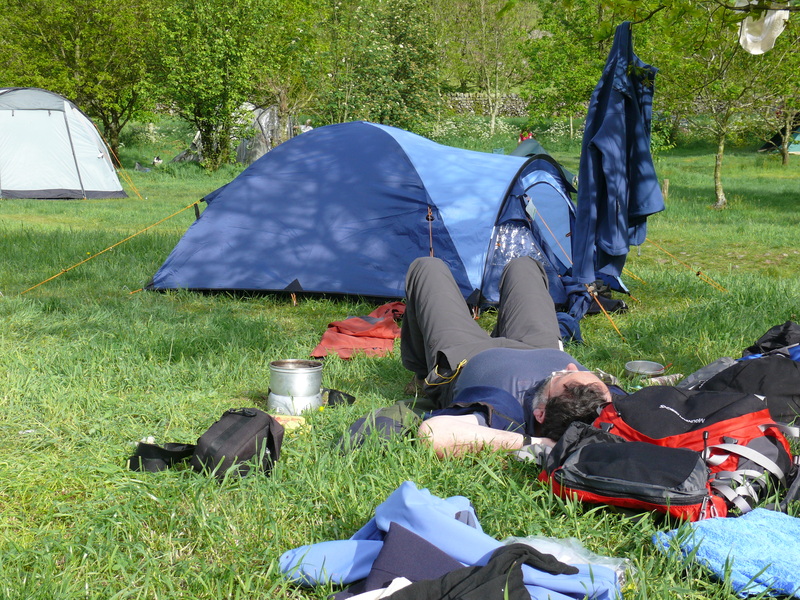 On Thursday we bought a tent (Vango Alpha 200 for GBP30.00) and the Vodaphone mobile modem we are now using. The 3G network in the UK is patchy, and my mum’s house only gets the lesser network (badly), so using the net is a pain! On Friday, we walked down to Mold, where we did some shopping, including the legendary Hulson’s pork pies, which we have travelled 20,000 km to enjoy. Worth every one of them! We also spent a couple of hours at the Theatre Clwyd cafe, having a horrible coffee, but using the 3G network to plan some of the rest of the trip. Next week we are going to the Lake District for a few days, where we will camp with John and Debbie for a few days at Wasdale Head, and hopefully climb Scafell Pike – highest peak in England. 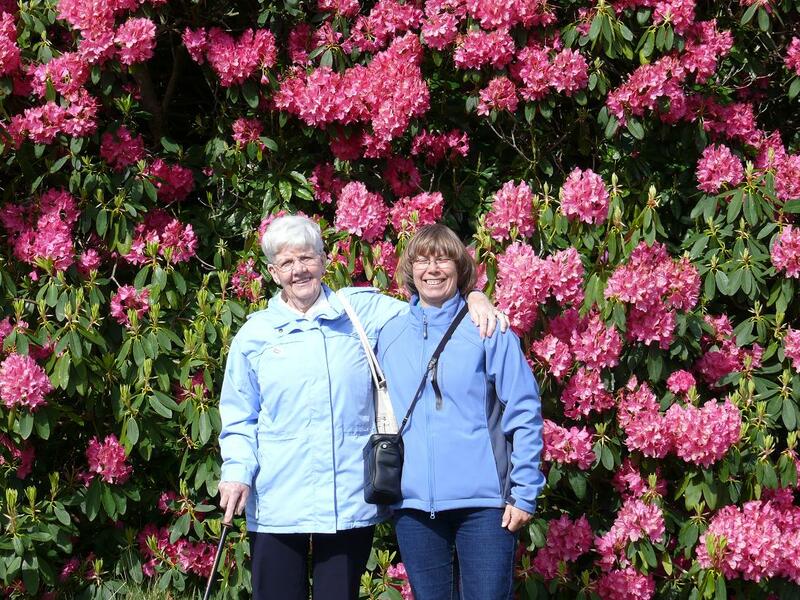 At the end of the week we will travel to Aberdeen to see Lynn’s Aunty June and Uncle Alan, who live about 40 miles inland. We will hire a car up there, and hopefully see some of Scotland, including a possible climb of Ben Nevis. On Saturday we went for a walk on Hoylake beach, and saw the windmills just offshore. Very impressive. In the afternoon we packed, and that evening we watched the Eurovision Song Contst for the first time in 20 odd years! It hasn’t changed much! Yesterday, we travelled down to Knoll House in Dorset in my mum’s Nissan Micra – 3 of us plus luggage! On the way we stopped off at St. Athans near Cardiff, where Richard is stationed, and took him out for a lovely meal in Llantwit Major(Illtuds 216 restaurant) just down the road. He is fit and well, and seems very happy with his career etc, so all’s well there! The drive down took 4.5 hours to Cardifff, then another4 hours to Knoll House, and we had a fair amount of rain on the way down. But it was fine by the timed we got to Dorset. Knoll house is a beautiful hotel, from the brochres etc you can’t help worrying that it will be a version of Fawlty Towers, but it really is a wonderful place. The bedrooms are very comfortable, and the dinner was delicious. Andrew met us before lunch, then helped wait on our table. He seems well, but hopefully we will see more of him today. Breakfast is in 30 mins, after that we may go somewhere local to see a bit of the area. So six trains and 3 buses, and about 11 hours of travelling, and the only delay was the narrow gauge train was 2 minutes late arriving in Blaenau Ffestiniog! An excellent trip though, comfortable trains, beautiful scenery, a great day. During the wait in Flint for the final bus, we went to visit Flint castle for the first time ever. Considering we used to live less than 10km away, it was a bit strange visiting it now! If anyone is reading this, sorry for the lack of posts, but since leaving Debbie and John’s we have not had internet access. This morning I went out and bought a Vodaphone Mobile broadband connection, and after a bit of fiddling it appears to work! It’s very slow from here in Wales, as there is no 3G coverage, and windows decided to take it over and is downloadingthe latest updates. Anyway, on Tuesday we went into Chester to have a look round, and picked up copies of train and bus timetables (no internet!) and had a terrible coffee. Tuesday night we planned our first expedition using our Britrail passes, a sort of shake down trip. We managed to stay up until 9:00pm. or lack of it. Managed to stay awake until about 9pm on our first night, and slept right through until 5am-ish, so we are feeling really good at the moment. Second night is usually the worst, but here’s hoping! Off to Wales this morning to my mum’s house, so thanks to Debbie and John in Nantwich for looking after us. Time to start the diet and exercise again, I put on two kilos on the trip – airline food (really rather good) and fluid retention hopefully, and it should soon come off! Lynn has about the same to lose. This morning is absolutely gorgeous, clear blue skies and already quite warm, so the travel gods shine on us! One of the things we were looking forward to was seeing a British spring, but were worried that we would get here too late to see it. This afternoon we went for a walk around Nantwich where we are staying briefly. 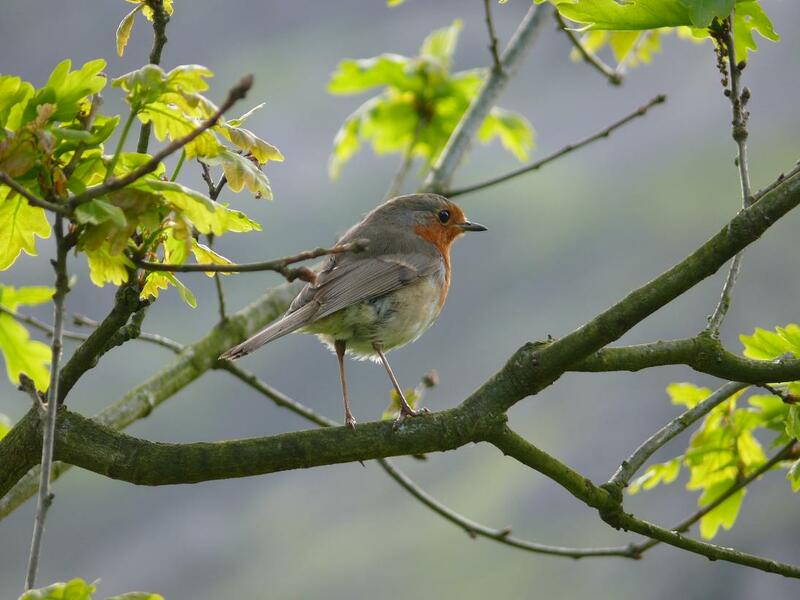 Walking alongside the River Weaver, the Nantwich canal, and footpaths connecting them together, and spring is very much in evidence. The May (Hawthorn) is in blossom and smells wonderful, and the Chestnut trees with their candles of flowers. In the garden outside the window I have just seen a robin and a rook, and there were ducklings and goslings on the ponds and canals. It was nice to see different butterflies again, and the odd squirrel! 14 hours on an aircraft is not an experience I want to repeat too often. Uneventful flight, but a bit bumpy with 200kph headwinds! Arrived in Manchester 40 minutes late, and spent 30 minutes getting through formalities. Brother-in-law John picked us up at the airport, and we are now sitting drinking coffee and eating toast and proper marmite. Will post more later when we are sorted. Well, its very humid, even if its not the 30 degrees it is outside Terminal 3! Tried to blog from Auckland, but the cheeky sods wanted 10 bucks for an hours access! Things were not too smooth from wellington, the flight had to return to the gate for repairs, and we were 45 mins late getting into Auckland, and our connection was a 12.00 flight, not 13.00, so all our plans for a relaxed time went out of the window, instead it was a swift walk from one plane to the other, with just enough time to buy a bottle of water each for the flight. Terminal 3 at Changi is magnificent, huge and grand in the old way, but modern clean and quiet! It takes 11 minutes to walk across the transfer lounge, which has more shops than a shopping mall in NZ! There are trains to take you to your departure gate it is a 15 minute walk otherwise. Free wireless internet is a bonus. We have 5 hours to kill between flights, but 1.5 have gone already! Its 8:30 pm local time, about 00:30 NZ time, so we are starting to flag a bit! Next stop Manchester, 14 hours of flying. 10.5 from NZ wasn’t too bad, and hopefully we can sleep through most of this one. Boeing 777 are pretty good for leg room and width, especially with Singapore, so as long as I can get up fairly often I am OK.